By the end of the late 19th century. in November 1896 in the old manor Krasavka Atkarsk, located in the Lysogorskaya province of Saratov province, a baby was born. The hopes were perhaps that the child would be a brave sailor - following in the careers of both father and grandfather, like most of the relatives on the mother's side, - called Mola - who were both vice-admirals and admirals. But now it happened that this beloved baby was ... a girl, Vera Konstatinovna. And because they called the child Vera, and the fate prepared for her as a gift, the expectation was that she would stay at the hearth and carry the on with family. Such it might have been, if not for three circumstances: her hot blood, the spirit of the time and the her parents. The blood in her was hot and burning - a mixture of Spanish - Mola and German - Amelung and Eberhardt. Times were turbulent, and major transformations came to the country - the revolution, war and repression, which caused her father's house to collapse, wealth to disappear, and several of her loved ones to be lost. Her Godfather Mikhail Shidlovsky who, together with her aunt Maria Pavlovna Molas, helped her greatly during her youth. He was an extraordinary man.The same age as her father, he was at the beginning of a marine career and also a partner in a Russian-Baltic ship factory; he also had interests in the Russian aviation industry. He was an intelligent and fearless man with outstanding organizational abilities, and not afraid of taking risks. He predicted the importance of a Russian aviation industry and contributed to this with all his power. He financed Igor Sikorsky, the Russian aviation industry's father. In 1914, Shidlovsky was appointed commander of a fighter squadron squad and became the first Russian airline General. He created a Russian air force that manifested itself during the First World War, but when the Provisional Government was appointed, he was dismissed for "incompetence" and in 1918 when his family tried to fly across the border to the Finnish Karelia, his 18-year-old son was killed by the "Red". Perhaps his mind, courage, and the pursuit of excitement, the ability to do everything wholeheartedly transferred to his god-daughter! Wolf hunt. Drawing by Vera Amelung. About Vera's childhood and youth, one can only guess. Most likely it was a normal and happy upbringing, surrounded by parents, sailors and many sisters, aunts and uncles, with the ingrained passion for the hunt. In Riga she graduated from a private high school under the distinguished teacher of Nikolaevna Lishina. She gave Vera teaching in Russian language, literature, history, French and drawing. In short, Vera was educated to be a true humanist. She had great artistic talent, and in 1918 she was admitted to Moscow Stroganov Art College. Vera studied until 1924 at her own expense - she also worked part-time at Bolsho's Jewish Children's Theater, where she later got a permanent job as a costume designer. A document about Vera was found at the Bolshoi Theater, a questionnaire completed by her in 1933. The document contained information about temporary work - grades from a work in Osoaviakhim as an instructor in official dog breeding. She was also a student at Architecture courses in Petrograd, and for a time she also studied under the artist Piotr Kelin. On the Internet you can read about Piotr Kelin that among his many students were B.V. Johanson, A.D. and PD. Korin, V.V. Majakovsky, D.S. Moore. Vera wrote: "I was lucky enough to be a student of the wonderful teacher and artist, Piotr Kelin." In her writings, she tells about the father who died in Revel in 1928 and also her many sisters in Moscow, Bashkiria and also in Lyon and Toulouse. One of them married an officer in the White Garde, and another - von Garder - also emigrated with her husband. It is also told about horses and cows owned by her parents, about the Orthodox religion, which, however, did not suit Vera. The religion had no place in the costume designer's work at the Bolshoi Theater, and was not accepted there It's strange to me how she survived with such a name, with such relatives and such passion for life! It is incomprehensible! 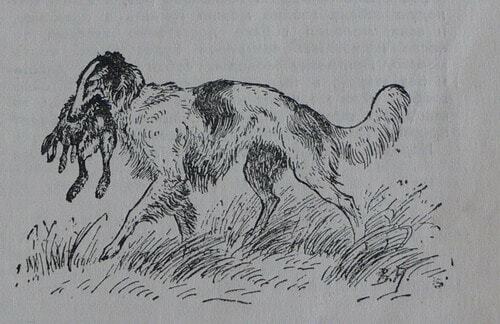 Gatchina and Perchino, together had hundreds of purebred dogs. Most were sold abroad before the revolution for large sums. 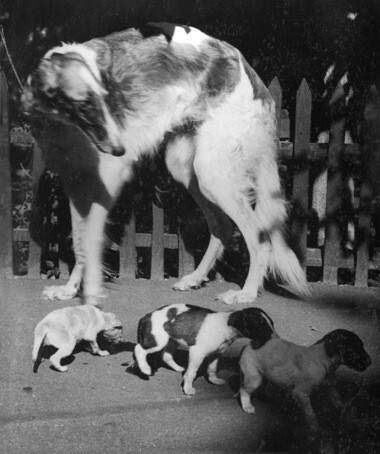 For the Bolshevik government, borzoi was regarded as a shameful relic from the past. When it came to light that it could be very profitable and have a commercial value, the attitude changed and it was then allowed to form clubs and associations. Borzoi lovers, "Borzyatniks", could meet the same engaged, fanatic people as they were themselves. Vera Konstantinovna Amelung was one of these. A miracle of a dog! She lived in central Moscow, on Gogol Boulevard, and she had several dogs. Through them she learned, chased a lot with them and began breeding. 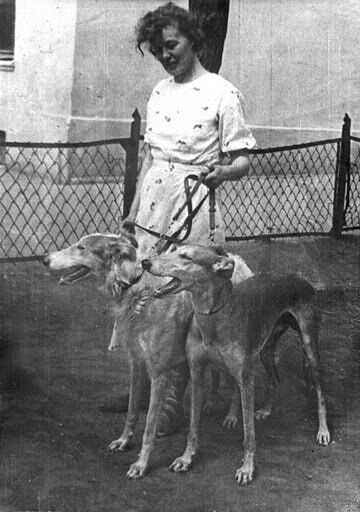 She participated in competitions and she was involved in the Borzoi Section in Moscow as secretary. There she is, Arbuns Swan! Even as an elderly lady, she was a good rider who flew in full speed ... Flew like the goddess Artemis! I never know what she felt when the war began. In addition to the general worry and fear, the fate of the dogs was a heavy burden with her. The animals are big and need a lot of food. She could keep them in Moscow. The fact that her legacy was preserved for the benefit and happiness of the aftermath was her, but also largely Mikhail Gromov's merit. Gromov was one of the Soviet Union heroes. He was a pilot with connections at all levels. 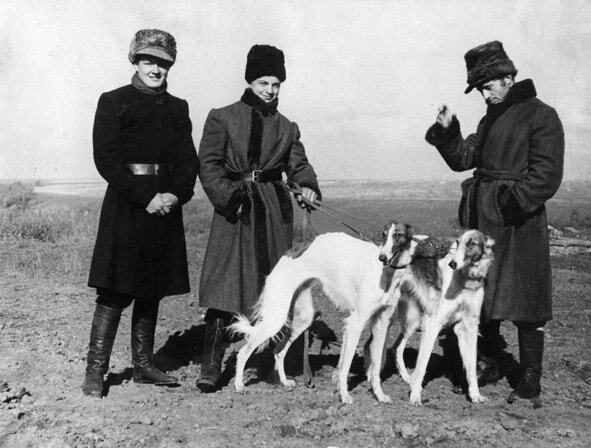 He was also chairman of the Borzois section of the Moscow hunting dog association. 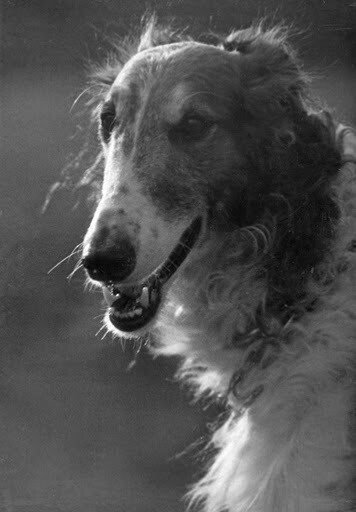 With his help and the extra ransons he could provide, many Borzoi could survive the war. 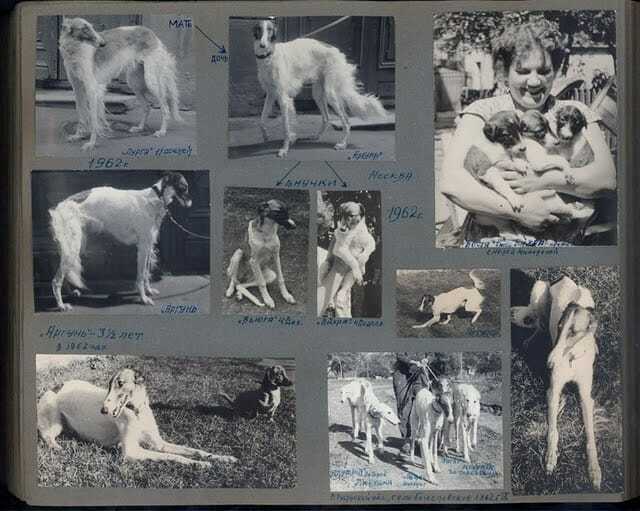 Gromov himself was Borzoi lover, and he brought home dogs from Germany who were very important for the restoration of the breed in the Soviet Union and later Russia. Vera Amelung was secretary and Mikhail Gromov chairman of the section. He stated that he put her knowledge very high: "she understood dogs better than anyone else". Från uppsättningen av filmen "War and Peace"
Her last dogs were Argun and Terzai, mother and son. They demanded all her income and effort, but it seems her beloved dogs could contribute to the owners' living. It happened when Vera Konstantinovna was invited to participate in the film "War and Peace" by Sergei Bondarchuk. Even when the dogs' participation was over, the director continued to love them to feed the "actors". The dogs were also "on duty" during the recording of "Anna Karenina"; they loved to go with the magnificent Maja Plisetskaja. During the post-war years, Vera Amelung was the permanent secretary of the Borzoi section. She was responsible for the pedigree books. There were four albums with neatly glued and signed pictures, with family tree and charts. They were digitalized by Tamara Lyazgina and were made into joint Internet property thanks to her. Because of this I see a clearer picture, which recent genealogists rarely expect. Vera: "As a little girl, I really wanted a dog, but my father directed my childhood wishes for long theoretical training. I had five or six albums with clips from newspapers, articles about the training of a puppy, I wrote of rare books with my childish writing, nicely arranged to carefully fill in over the years. I do not stop being surprised by these rings of genes, we all come from our past and we will give this to the future". Olga Velchinskaya told about meetings with Vera Konstantinovna. She came to her when she was seriously ill, her son and Amelung were acquainted. "The impression of the person who met me, with her diversity of skills, within so many areas was impossible to forget." Everything she predicted was exactly as she said. In this description, her portrait is of these times and several are important for understanding her character and way of life. Olga: She was sick but still strong and moving. There were very few things in her cellar. But in the ancient armchair under the imperial clock lay, delicate and elegant like a swan, a pink-white beauty, Argun. She tells that neighbors come and leave Vera a bowl with sauerkraut. Detina - a boy from this area where everyone knew Vera, they loved her and her beautiful dogs. Even after they became adults, they continued to help her. The antique clocks also beats for the children, they knew what suited the goddess. Dogs and children - their love is the most sincere, the most faithful. They warm up the heart and decorate life! There were a whole group of women who were seriously engaged in dogs. 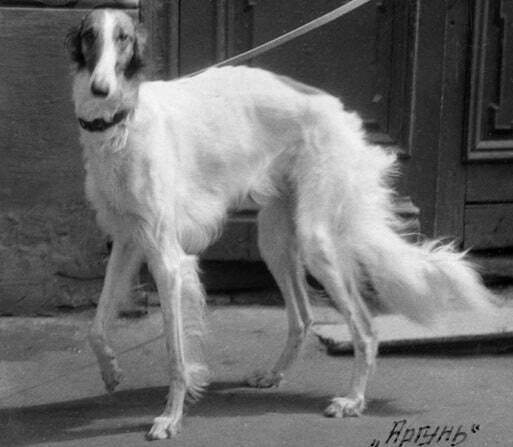 One of them, Eugenia Dezor, collected two borzoi from the Gatchina kennels in the Leningrad zoo and cleverly used them in breeding. She worked hard to revive the Russian borzoi. She was arrested and sent to the Saratov region. Vera: I could take out five of my dogs from Saratov. 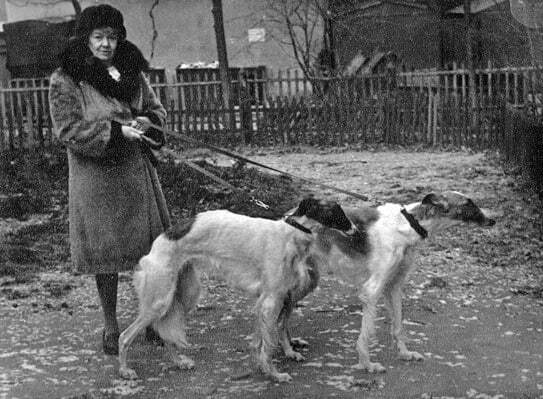 Eugenia Dezor's efforts to create a kennel for borzoi and hunting dogs (Saratov) succeded at last. In her spare time she wrote poetry. Their lines sound to me in Vera Konstantinova's voice. and only in my dogs I see joy. they know and they realize. and we spend the evenings and the days. -We share protection and food. in the dawn of the darkness. and there are no more beautiful dogs on earth. Life has to go on, she had to leave her apartment on Gogol Boulevard. There were no communal apartments in central Moscow she could rent. New settlers went to Chertanovo. Vera Konstantinovna also got a small apartment there. But, as Olga Velchinskaya writes, "she could no longer have her dogs with her." She got old and sick, and she was separated from friends and old neighbors. In 1972 she was for the last time at the Russian show for hunting dogs. Argun and Terzai had been left to reliable friends. She died very soon afterwards in her one bedroom apartment. I think, now, at last she became lonely, now that the wet nose no longer touched her old hand, and there was no one who looked at her with endless love, who saw her as their true goddess. I'm looking at my huge family tree. We have a common grandfather, a mirror maker, Anton Christoph Amelung. Grandfather's father, Carl Philip Amelung, ran business and played chess with Potemkin. Anna Edvardina, my grandmother's mother, was Carl Philips's sister. All of a sudden, Vera Konstantinovna became my grandmother! From Argun (Amelung) to Slavnyj Alexej Jermolov, imported to Sweden in 1982.